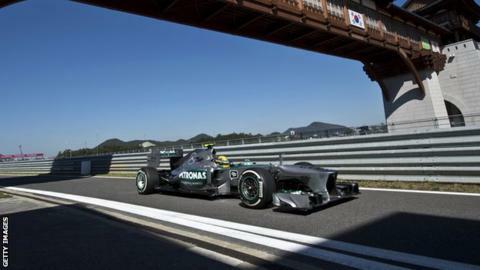 The 2015 Formula 1 calendar has been set at a record 21 races by world governing body the FIA. The provisional return of the Korean Grand Prix allied to a new race in Mexico increases the number of events from the 19 held in 2014. The FIA's World Motor Sport Council (WMSC) also confirmed plans to abandon the controversial double points rule. In addition, a new rule to prevent drivers under the age of 18 from racing in F1 will be adopted in 2016. The FIA also used Wednesday's WMSC meeting to announce the findings of a 10-man investigation into Jules Bianchi's crash at the Japanese Grand Prix. The report, which runs to 396 pages, states that Bianchi, who remains unconscious in hospital, did not slow down sufficiently to avoid losing control at Suzuka in October. The move to set the calendar at 21 races would eclipse the 20-race campaign held in 2012. The Korean Grand Prix was dropped for 2014 but is back in a provisional date of 3 May, which would make it the fifth race of the season, just a week before the following round in Spain. Mexico returns to the calendar after a 23-year absence, with a race scheduled for 1 November in Mexico City. The season will start in Australia on 15 March. The council also ratified the decision to ditch the double points rule, which was agreed by F1 bosses last week. The WMSC also stiffened the rules regarding the awarding of a super licence, the document that allows a driver to compete in F1, which will come into force for 2016. Previously, drivers had to complete a total of 300kms on track in an F1 car to qualify for a super licence. Now any driver will be required to hold a valid driving licence, be at least 18 years of age and understand the sporting regulations and international sporting code. They must also have two years' experience in minor formulas. The announcement is response to the influx of young drivers, highlighted by Toro Rosso's acquisition of Max Verstappen, who will be just 17 when he makes his debut for the team next season. A plan to introduce standing re-starts after the introduction of a safety car was also jettisoned after teams raised safety concerns. However a 'virtual safety car' system was agreed, which would be used when double waved yellow flags are needed on any section of track and competitors or officials may be in danger, but the circumstances are not severe enough to warrant use of the safety car itself. A full breakdown of the decisions of the World Motor Sport Council can be read here.